You can read their independent, detailed reviews here: NordicTrack 1750 and the ProForm Pro 2000. We have also created in-depth videos reviewing each treadmill which you can find below. When you’re considering a serious purchase, a side-by-side comparison can help you make your final decision. In this review, we’ve compared general specs on each treadmill while offering our opinion when it comes to choosing one of these two great treadmills for your home gym. Between the Pro 2000 and the Commercial 1750, our simplified recommendation would be to purchase the NordicTrack Commercial 1750. Between both treadmills, they are vastly similar when comparing major components. But we feel the Commercial 1750 is worth the extra cost because of its versatility, slightly larger motor, and ease of use. Cost – While these two treadmills fall into the same price category, the Commercial 1750 is generally a little over $200 more expensive than the Pro 2000. The price gap fluctuates depending on the sales running on their respective sites, but overall, the Pro 2000 is more affordable than the Commercial 1750. Weight Capacity – Both of these treadmills have the identical weight capacity of 300 lbs. Heavier users looking for a residential treadmill are better off looking at SOLE treadmills as they can hold users weighing up to 300-400 lbs. Available Programs – While there are many programs available on both the Pro 2000 and the NordicTrack 1750, there are six more exercise programs built into the NordicTrack 1750 than are available on the Pro 2000. 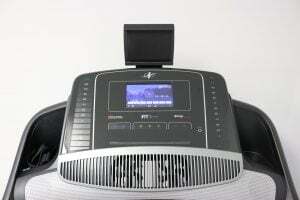 Dimensions – Both of these treadmills are fairly bulky, with the Pro 2000 measuring 70” tall, 77.2” long, and 39.5” wide, while the Commercial 1750 measures 61” tall, 72.25” long, and 38” wide. However, as you can see from their compared measurements, the Commercial 1750 is slightly slimmer in dimensions. Running Surface – When comparing the treadmill belts, the Pro 2000 and the Commercial 1750 both have 22” wide and 60” long treadmill belts. These belts are also non-stretch and commercial but a key difference is that the Commercial 1750 belt is 2-ply while the Pro 2000 is only 1-ply. The ply difference will affect the durability of your treadmill belt, with the 2-ply belt able to last longer. Folding – Both of these treadmills can fold up easily and have hydraulic systems to make the raising and lowering of the treadmill decks easy for a single user. Motor Size – The 3.6 CHP motor in the NordicTrack 1750 is stronger than the 3.5 CHP motor in the Pro 2000 treadmill. This is an important feature for those who will be using their treadmill for regularly training as they will want a strong motor that will be able to keep up with them. Incline Range – These treadmills have the same incline range, able to decline to -3% and can incline up to 15%. This can add extra difficulty to any workout and allow those who live in flat areas to fit in good hill workouts. Speed – Both treadmills max out at 12 MPH. This is standard from most treadmills in this price range. Fans – Unsurprisingly, the NordicTrack 1750 fans outperform the Pro 2000 fans. We’ve found this to be true at nearly every price point. NordicTrack treadmills come with fans that produce a good amount of wind while their competitors have fans that are practically useless. While the Pro 2000 fans aren’t useless, their cooling output is less strong compared to the Commercial 1750. Heart Rate Monitoring – Both the Pro 2000 and the NordicTrack 1750, have handlebar grips as well as Bluetooth wireless chest straps for heart rate monitoring. Neither treadmill handlebar grips are very accurate in their measurements. However, the Bluetooth chest straps are an accurate way to receive heart rate tracking information. The NordicTrack 1750 comes with an iFit chest strap and the Pro 2000 comes with a Polar chest strap. 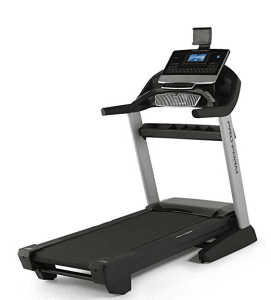 Treadmill Weight – There is a 10 lbs difference between the Pro 2000 and Commercial 1750, with the NordicTrack 1750 being the lighter of the two treadmills. Materials – There are many material similarities between the Pro 2000 and the NordicTrack. Both have several molded plastic parts as well as heavy commercial-quality frames. 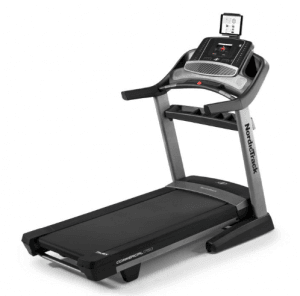 Sturdiness – With heavy, wide bases, these treadmills are both sturdy treadmills whether you are using them for walking or for running. Even at a 15% incline, both the Pro 2000 and the Commercial 1750 will hold steady. Moving the treadmill – Both of these treadmills need to be tilted to be rolled and moved. However, the Commercial 1750 is a little lighter and easier to maneuver compared to the Pro 2000. Cushioning – The decks of both the Pro 2000 and the NordicTrack 1750 are well-cushioned. ProShox™ cushioning comes with the Pro 2000 and Flex™ cushioning comes with the NordicTrack 1750. However, the NordicTrack 1750 allows users to change the flexibility of the deck to the user’s preference. Assembly – Putting together the Pro 2000 is a little simpler than assembling the Commercial 1750. Speed and Incline Controls – On both the Pro 2000 and the NordicTrack 1750, the speed and incline controls are responsive to the touch. Some difficulty can come when using the controls on the Pro 2000, as the incline control are stacked directly above the speed control. Making a mistake can cause issues during the workout. The separated controls on the NordicTrack 1750 are easier to use as there is little opportunity for confusion or accidental mixup. Fan Controls – There are two-button fan controls on both the Pro 2000 and the NordicTrack 1750. The position and ease of use of these controls is identical between these two treadmills. Program Selection – It is easier to select a workout program on the NordicTrack 1750. The touchscreen makes for easy scrolling and all the workout programs are broken down into targeted exercises and arranged from beginner to advanced levels. On the Pro 2000, you will have to cycle through the various programs and the different workouts aren’t labeled beyond a number saying which workout you are accessing. Visual Display – Both displays on these treadmills are 7” displays. 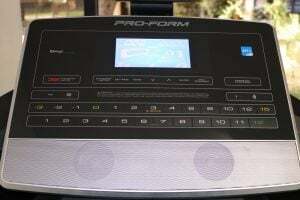 But the NordicTrack 1750 comes with a touchscreen that allows to stream iFit Coach workouts while the Pro 2000 display is only a static, backlit display. Speakers – The speakers on the NordicTrack 1750 is superior to the sound quality of the Pro 2000. Overall sound quality of both is good up to the mid-volume level but the sound quality of the Pro 2000 starts to deteriorate at the higher volumes sooner than it does on the NordicTrack 1750. Other Entertainment Features – Users can place a tablet in the integrated tablet holder of both of these treadmills. However, the NordicTrack 1750 allows users to access the internet or use a variety of apps such as news apps, Facebook, YouTube, and more, allowing users to enjoy more entertainment while using the NordicTrack 1750. 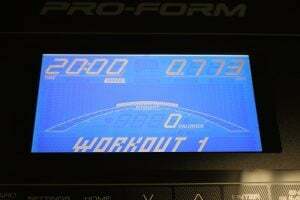 Data Display – During your workout, both treadmills display sets of data so you can measure your progress. 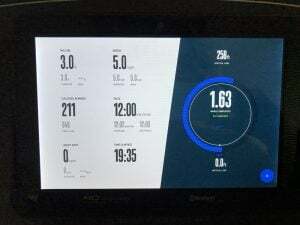 If information metrics are important to your workouts, it may be important to you to see what feedback you can receive from these treadmills. For the most information and feedback, users should choose the Commercial 1750. Fitness Apps – Both of these treadmills can sync with iFit Coach, which gives users access to thousands of workout videos and interactive workouts. Users will need to sync a tablet or phone with their Pro 2000 to use iFit Coach. The ProForm Pro 2000 and the NordicTrack Commercial 1750 are similar treadmills, enough so that they tied in 12 of our 27 categories. But, the Pro 2000 was only able to beat the Commercial 1750 in 2 categories outright while the Commercial 1750 was the best in 13 of the 27 categories we used for measurement. Since these treadmills are so similar, it makes sense to choose the Commercial 1750 for purchase as it easily outperforms the Pro 2000.